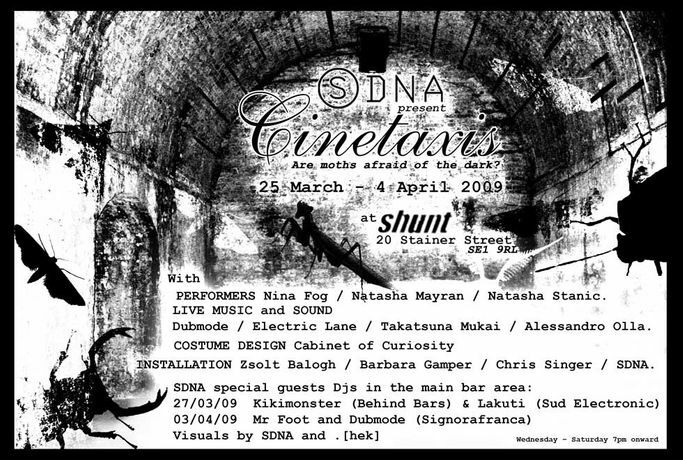 SDNA will take over the cavernous corridor of SHUNT, transforming it into the both beautiful and grotesque: the fascinating and unsettling world of CINETAXIS. Cinetaxis is a unique personal insight into the world of insects. Giant projections, kinetic sculptures, high voltage lighting and interactive installations with live interventions  think electronic music, offbeat performance, origami costumes and magnified insects crawling out of the walls. This 'live' audio/visual installation will transform over the two weeks, so plan more than one visit. You'll find something new to discover every time.